Buying. We buy books published by the Shimbi Shoin. If you have material to sell, please contact us. All the books below, and any others, are of interest. Selling. If we have a book in stock, a link to the offering is provided. We have special privileges and advantages for photographing any painting in Japan, and are not boasting very much if we say that there is not a prized painting existing in Japan that we have not yet reproduced and published. These art reproductions were marketed in several formats. Bound Volumes. The major Shimbi Shoin marketing effort, at least in the period between 1910s and the 1920s, was the sale of art reproduction plates in bound volumes. Generally, these were sets of books. You will find many of these sets listed below. In this marketing effort, the company published a series of priced catalogues in English presenting these publications. While the precise titles of these catalogues sometimes varied, they all contained Valuable and Important Japanese Art Publications in the title. These catalogues are themselves collectable and usually have a woodblock cover (generally in color) and occasionally an additional color woodblock at the rear. The earliest such book catalogue I am aware of is dated 1920 and the latest 1922. However, there are a couple of undated catalogues which appear to be from the mid-1910s. Plate Portfolios. On a limited basis, folios of plates were marketed. The composition of the folio was established by the Shimbi Shoin. Often these were the same plates found in the books but marketed in the loose plate folio type format. The plate folios were generally housed in a cardboard folding case. Individual Plates. A significant marketing effort of the Shimbi Shoin was focused on marketing single sheet art reproductions (loose prints) that were sold individually. The company also sold folding cases for the prints. These folding cases were substantial in nature with a wood reinforced area for the plates, cloth covers and ivory type claps. To see a set of five such prints, with a folding case, click here. These individual print art reproduction items were marketed through as series of English language priced catalogues that were titled Old Masters of the Far East, Wood-Cut Reproductions. The earliest such catalogue I have seen was dated 1911 and the latest was dated 1937. It is not unusual to find Shimbi Shoin art reproductions with stickers or printing on the back of the art or accompanying folder which attributes the work to the Shimbi Shoin. Sometimes the information printed on the back includes the stock number assigned by Shimbi Shoin, the name of the artist and the period. These works sometimes have an address of "Shimbishoin, Ginza, Tokyo." Miscellaneous Items. In a 1919 catalogue of it's woodcut reproductions the company noted it's business included wood-cut color prints, collotype prints, folding fans with old and new pictures, picture post cards, menu cards, name cards and advertising books. A catalogue listing published ca 1911 listed and pictured 9 different book type calendars for 1911 and 8 different hanging calendars. The same catalogue contained a listing of 79 different picture post cards/menu cards. The approximate date the Shimbi Shoin started business is unclear. I believe that it's earliest significant art reproduction publication may have been in 1903. It certainly came to the forefront of this type of publishing in 1906 when it continued the publication of the series titled Selected Relics of Japanese Art which was started in 1898 by Nippon Bukkyo Shimbi Kyokwai, Kyoto. An article published in June 1904 notes that the Shimbi Shoin was the successor to the Nippon Shimbi Kyokwai in the publication of this set. Likewise, I have not fixed the exact date that Shimbi Shoin ceased business but it appears to be in 1938. While the book Masterpieces in the Imperial Fine Art Exhibition 1934, published in 1934, appears to be the company's last major publication, books and art work reproductions are occasionally attributed to it through the late 1930s. The last 30 years or so, have, however, witnessed a sort of revival, by no means without merit in its way; and the adaptation of the process to the requirements of book-illustration and the reproduction of works of art has reached a remarkably high standard in such publications as the Kokka and those of the Shimbi Shoin. For a discussion of the relationship between Shimbi Shoin and Kazumasa Ogawa and the reproduction of Japanese classic art, click here. The major Shimbi Shoin art reproduction books employed two high quality forms of printing to reproduce art. Color reproductions were executed in color woodblock prints (chromoxylographs). Items reproduced in black and white were executed in collotype prints. For more information on these printing processes, click here. The Shimbi Shoin used the printing services of the Tokyo Tsukiji Type Foundry for some of it's publications. The Tsukiji Type Foundry was founded by Motoki Shozo (the Gutenberg of Japan) in the late 1860s and was initially located in Nagasaki. In 1872 the enterprise was relocated to Tsukiji district in Tokyo and the name was changed to Tokyo Tsukiji Type Foundry. This business was multifaceted and included printing (including lithographic, collotype, haftone) as well as typesetting. The Foundry was a major factor in the Japanese printing industry and often noted in the credits of newspapers, magazines, maps and books through the 1930s. For more information on the enterprise and books it printed, click here. Based upon a review of catalogues published by the company, I believe that by the mid-1920s the company's focus shifted from books to marketing single sheet art reproductions. A catalogue published in 1925 listed only single sheet reproductions and no books. Subsequent catalogues were the same with no books listed. A review of the books published by Shimbi Shoin leads to the same conclusion. Very few books were published by the company after 1925 and those that were published were small format (8vo) rather than the large folio format used for most of it's art reproduction books. A competitor of the Shimbi Shoin in woodblock facsimile books was the Toyko publishers, Tosho Kankokei & Kikkawa Kobunkan. In books issued in 1916 and 1917, they produced reproductions of acclaimed masterpieces by Harunobu, Shunsho, Shigemasa, Hokusai, Utamaro, Buncho and others. A partial listing of these books is found below. Below follows a work in progress bibliography of Shimbi Shoin publications. The bibliography is not represented as complete and I can not warrant the information. Except where a book, or set, has a link to a page on my site, I have not personally examined the material and can not vouch for the accuracy. Most of the listings are composed of information extracted from published sources (printed and internet listings). It is important to note that often the Shimbi Shoin printed books in standard and deluxe versions. In addition, they were sometimes printed in English or Japanese or in both languages. It is even reported that within the same versions, the precise number and types of plates may vary. Obviously, this is a very complex area and this listing is by no means considered definitve. Consider it a preliminary guide or outline only. I would like to express my appreciation to Mr. Robert Burawoy of Paris for his invaluable assistance in expanding the listing and sharing his great expertise in this area. Most books were printed in standard and deluxe versions. Even if that is not noted in a listing below, you should be aware that it is very possible two versions exist. General characteristics of the deluxe versions can be found here. 1899-1908, Selected Relics of Japanese Art: Nippon Shimbi Taikwan, Shiiji Tajima, editior, Nippon Bukkyo Shimbi Kyokwai, Kyoto (Volumes 1-11, 1899-1905) replaced by Shimbi Shoin, Tokyo, (Volumes 12-20, 1906~1908), paper or cloth (silk) covers (deluxe edition), folio (19 x 13 in - 49 x 34 cm), 20 volumes, double folded leaves, bound Japanese style, purple silk threads, two edges gilt, 941 plates (88 color). Each folio in folding slipcase with ivory clasps. Text in English and Japanese. Collotypes by K. Ogawa in the first 6 volumes of the set. Reproductions of Art Relics from the earliest times up to the end of the Tokugawa Era from collections in Buddhist Temples in Nara and Kyoto. The issues (deluxe edition) bound in silk originally sold for 20% more than the regular issues. The standard and deluxe edtions both have the same number of color plates. The Wenckstern Bibliography (Volume 2), has the table of contents for the first ten volumes (see pages 288-304, Wenckstern, Vol 2). For detailed information on this 20 volume set, click here. 1903-1906, Shiichi Tajima, Korin-Ha Gwasshu (Masterpieces Selected from the Korin School with Biographical Sketches of the Artists of the School and Some Critical Descriptions), Shimbi Shoin, Tokyo, 1903-6, folio (12 x 16 1/2 in - 43 x 31 cm), 5 volumes, folio, 153(163?) plates (80 in color woodcuts, 2 are folding - 73 are collotypes) silk boards, 37 pp of text. Paintings of the Sotatsu-Korin school; Volumes 1-2, Korin Ogata -- Volume 3, Kenzan, Shiko -- Volume 4, Hoitsu -- Volume 5, Hoitsu & Kiitsu. 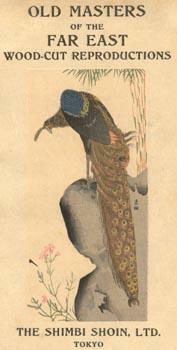 Illustrates many of the works of Ogata Korin and members of his school. Issued in standard (2000 copies) and deluxe versions. For more information on volume 1 of this set, click here. 1903, Shiichi Tajima, Motonobu Gashu, Shimbi Shoin, Tokyo, 1903, folio (12 x 16 3/4 in), 1 Volumes, 64 black and white collotype plates, light blue cloth with purple string ties, all edges gilt, each housed in a folding grass covered slipcase with ivory clasps, Japaense edition, text in Japanese. 1904, Shiichi Tajima, Masterpieces by Motonobu With Critical Description, and a Biographical Sketch of the Artist, Shimbi Shoin, Tokyo, 1904, large folio (16 1/2 x 12 1/4 in - 42.5 x 31 cm), 2 volumes, 100 plates. For more information on the 2 volume set, click here. 1904, Shiichi Tajima, Masterpieces by Jakuchu, The Kwansai Photograph Company, Osaka, large folio (19 x 13 3/8 in - 48.5 x 34 cm), 30 plates (6 color woodblocks & 24 black and white collotypes), 3 pages of text. Not a Shimbi Shoin publication, but an identical type art reproduction publication. For more information on this book, click here. Note: The below information has been extracted from Wenkstern. These items are listed in more detail throughout this list. "Masterpieces of Thirty Great Japanese Painters" 1906, 19 colored woodblocks and 31 collotype reprinted from the Kokka). 1904-1910, Nanso Meigwaen (Celebrated Pictures of the Southern School), Shimbi Shoin, Tokyo (13 Shinsakana-cho, Kyobashi-ku), 1904-1909, 20 folios (sometimes found bound into 4 volumes), issued in installments over a six year period, folio (19 1/4 x 13 1/2 in - 49 x 34.2 cm), folio, bound Japanese style, crepe type paper over cardboard wraps, ribbon ties, 10 black and white collotype plates in each volume, text in Japanese. Each volume has a listing of plates (in Japanese). Each plate is preceded by a tissue guard with descriptive information regarding the plate (in Japanese). The collotype images are large and generally cover 65%-80% of the plate/page. In 1912 a second edition of the set with 25 folios bound into 5 books was issued. For more information on this set, click here. 1906-9, Shiichi Tajima, Masterpieces Selected from the Ukiyoye School, Shimbi Shoin, Tokyo, 1906-9, Volumes I-V, folio (13 1/2 x 19 1/2 in - 34.2 x 49.5 cm), silk covered boards with a woodblock illustration on the front board, edges beveled, spine covered in decorated silk cloth, purple silk ties, title in English in gilt on front board, top and bottom page edges in gilt, text in English, 170 plates (158 color woodblock and 12 black and white collotype), 215 pp (211 numbered text pages and a 4 page preface). Each plate is preceded by a tissue guard with information in English regarding the plate that follows. There are numerous text illustrations in the text pages. While most are woodcuts, a few are collotypes. The cover woodblock illustrations are different on each of the five volumes. Issued with a straw textured folding case with ivory type clasps. Each volume contains a numbered limitation statement. According to Shimbi Shoin catalogues "Regular" and "Special" editions were issued in a total quantity of 600 sets and an "Edition de luxe" was issued in a quantity of 100 sets. A Japanese language version (Ukiyoye-ha Gwashu) has been reported. It is unclear whether it is included as a part of the total of 700 sets said by Shimbi Shoin to have been issued. Considered to be one of the finest examples of Japanese xylographic art in it's own right. For more information on the the complete five volume set, click here. 1907, Process of Wood-Cut Printing. This book illustrates the printing process used to reproduce original paintings using a 19th century painting by Shusho Katsukawa. The 127 pairs of prints each show, on the right (cumulative image) and left (image from the individual block used at that stage). 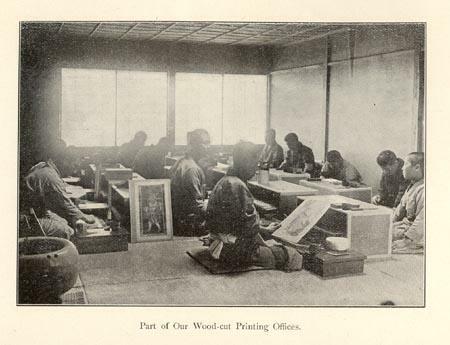 1907, Process of Wood-Cut Printing Explained, string ties, stated printing date of March 10th of Meiji 40 (1907). The book measures 5 x 6 1/2 in. A step by step illustrated guide to how woodblock prints are made. Using a single print as the basis for the guide as you go through the book a single color woodblock print progresses through it's various manufacturing processes become a completed image. Several editions were subsequently published. A later printing (c1920) of this book is discussed in detail below (with pictures). 1907, Sesshu Sansui Dai Emaki (Sesshu Long Scroll), Shimbi Shoin, Tokyo, 1907, housed in traditional paulownia scroll box. 1907, Sesshu Sansui Sho-chokwan (Sesshu Short Scroll), Shimbi Shoin, Tokyo, 1907, housed in traditional paulownia scroll box. 1907, Shiichi Tajima, Shina Meigwashu: A Selection of Famous Chinese Paintings, Shimbi Shoin, Tokyo, 1907, 2 volumes, folio, 30 color woodblock prints. 1907-8, Siichi Tajima, Masterpieces Selected from the Maruyama School: Maruyama-ha Gwasshu, Shimbi Shoin, 2 volumes, folio, standard and deluxe versions, 100 plates, 30 of which are color woodblock prints. Reprinted in one volume in 1911 with 58 plates, 38 of which are color woodblock prints. c1908, A Catalogue of Valuable & Important Japanese Art Publication, small 8vo (6 x 8 1/4 in - 15 x 22 cm), paper wraps, front cover with color wood-cut, back cover with woodcut of Shimbi Shoin mark, sales catalogue published by The Shimbi Shoin, undated but c1908 based upon contents, 43 pp. This appears to be one of the first Shimbi Shoin sales catalogue. It is undated. The first 21 pages cover publications for sale and these are: Selected Relics of Japanese Art, Masterpieces of Motonobu, Masterpieces Selected from the Korin School, Masterpieces Selected from the Ukiyoye School, One Hundred Japanese Masterpieces, Nanshu Meigwa-yen (Masterpieces of the Southern School of Painting), Hiroshige's Twelve Views of Mount Fuji and Hokusai's Shashin Gafu. These listings are priced in yen. They are followed by 4 pages of "Some Celebrated Names Among our Patrons." The balance of the book (pages 26-43) contains extracts from press comments on various publications. To see the front cover, click here. c1908, Hiroshige's Twelve Views of Mount Fuji, described in a Shimbi Shoin catalogue (c1908) in these terms: "The pictures reporduced in this album, were painted by Hiroshigi Ando, one of the greatest landscape painters among the Ukiyoye artists. The depict various views of Mount Fuji from a number of different stations along the old Tokaido...Number of Plates: Twelve...Size of Plates: 1 ft 3/4 inch by (6)7/8 in...Price Y350." c1908, Hokusai's Shashin Gafu, described in a Shimbi shoin catalogue (c1908) in these terms: The plates in this album are reproduced from the 'Shishin Gawfu,' by Hokusai Katsushika, one of the greatest artist of the Ukiyoye school....Number of Plates: Fifteen...Size of Each Plate: 10 5/8 inches by 6 7/8 inches...Price: Y150. 1909, Sesshu ga Nagamaki (Sesshu's Long Scroll), Shimbi Shoin, Tokyo, 1909, 23 x 391 cm, housed in traditional paulownia scroll box. A 12+ foot long series of panels, folded in accordian form, with a landscape painting by Sesshu. The last two panels contain Japanese text. Printed in collotype. 1909, Masterpieces Selected from the Maruyama School, Shimbi Shoin, Tokyo, 1909 (Meiji 42), a two volume set, folio (13 1/2 x 19 1/2 in - 34.2 x 49.5 cm), silk covered boards with a woodblock illustration on the front board, edges beveled, spine covered in decorated silk cloth, purple silk ties, title in English in gilt on front board, top and bottom page edges in gilt, text in English, 101 plates (36 color woodblock and 65 black and white collotype), 9 text pages (thin paper folded). For more information on the first edition (2 volume set) of 1909, here. 1909, Tokyo Fine Art School Mihon Meigwa Hyakusen (One Hundred Masterpieces of Japanese Pictorial Art Selected by Members of the Faculty of the Tokyo Fine Art School), Shimbi Shoin, 2 volumes, folio, 100 plates, 20 of which are color boodblock plates. Reprinted in 1913. For more information on the first edition of 1909, here. 1909, Tajima Shiichi, Bunjinga Sandaika-Shu, Shimbi Shoin, Tokyo, 1909, 1st edition, folio, silk covers and silk title label, 48 plates (37 collotype and 11 color wood-cut). Reproductions of paintings by the "Three Masters" of Japanese painting: Tanomura Chikuden, Watanabe Kazan, and Yosa Buson. Published in standard and deluxe versions. Republished in 1914. In a 1920 sales catalogue, the company states the book has 54 plates with no mention of a deluxe edition. However, forty-eight appears to be the correct number of plates and a deluxe edition was sold. 1909, Shiichi Tajima, Sesshu Gwashu: Masterpieces by Sesshu, Shimbi Shoin, Tokyo, 1909, standard and deluxe editions. 1909, Shiichi Tajima, Zengetsu Daishi Juroku Rakan (Sixteen Arhats by Zengetsu Daishi), Shimbi Shoin, Tokyo, 1909, folio, standard edition only, 16 plates, 2 of which are color woodblock prints. 1909, Shiichi Tajima, Bunjingwa Sadaika-shu (Selections from the Three Bunjingwa Schools, Shimbi Shoin, Tokyo, 1909, standard and deluxe editions, folio, 54 plates, 11 of which are color woodblock plates. 1909, Hikkoen: The Classical Chinese Painting, Shimbi Shoin, Tokyo, 1910, standard and deluxe editions. 1909-10, compiled by the Department of the Imperial Household, Migaku Matano & Omura Seigai (compilers) Toyei Shuko: An Illustrated Catalogue of the Ancient Imperial Treasury Called Shosoin at Nara, Shimbi Shoin, Tokyo, 1909-10, folio (19 1/4 x 13 1/4 in). 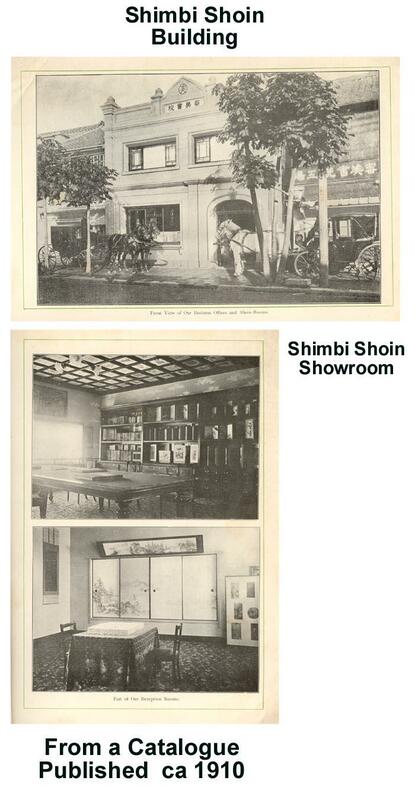 Shimbi Shoin catalogues in 1920 and 1922 list only a 3 volume set in ordinary and edition deluxe containing 200 plates. The three volumes contain a total of 200+ plates (woodcuts and collotypes), 55 of which are in color. Also reported in a "Revised Edition" housed in a decorative cloth covered wooden boxes with plates loose. This edition has been reported to contain 93 pages of text (27 + 66) and 166 plates (25 color woodcuts and the balance black and white collotypes). A 6 volume set with 353 plates and the separate booklet has been reported. 1909-18, Shiichi Tajima, Kanroku Kubota & Seigai Omura, Masterpieces Selected From the Fine Arts of the Far East and History of Japanese Pictorial Art (T�y� Bijutsu Taikwan), Shimbi Shoin, Tokyo, 1909-18, folio (19 1/2 x 13 1/2 in - 50 x 34 cm), illustrated silk over boards, purple silk threads, each with a clasped wrap-around case, 15 (16) volumes. The complete set contains a total of 1007 plates.. Volumes 1-7 are on Japanese paintings beginning with the Asaka period through the Tokugawa period. They contain extensive sections on Kano, Tosa, Korin and Ukiyoye schools. Volume 8-12 are on Chinese paintings from ancient times through the Ching dynasty. The Chinese paintings in these five volumes are held in collections in Japan. Volumes 13-14 are on Chinese sculpture. Volume 15 is on Japanese sculpture. These numbered volumes are accompanied by an unnumbered History of Japanese Pictorial Art, text volume. Masterpieces Selected From the Fine Arts of the Far East. 1909, Volumes 1-7, plates only, Japanese paintings, edited by Shiichi Tajima, plates are halftone, collotype, color woodblocks etc, total of 485 plates, complete set (8 books) includes a companion text volume by Seigai Omura (see above). 1910 & 1918, Volumes 8-9, Chinese paintings (Volumes I & II), edited by Shiichi Tajima, original text by Seigai Omura, plates are black & white collotype and color woodblocks, a total of 129 plates. 1910 & 1918, Volumes 10-12, Chinese paintings (Volumes III - V), edited by Kanroku Kubota, original text by Seigai Omura, plates are black & white collotype and color woodblocks, total of 178 plates. 1910 & 1918, Volumes 13-15, Chinese & Japanese Sculptures, a total of 215 plates. Volume 16 is sometimes mentioned in Shimbi Shoin price lists but I believe it is actually the text "History" volume. History (text) volume (English), 1909, Seigai Omura, 182 pp. This volume contains art history and more detailed information on plates in Volumes 1-7 (Japanese paintings). The Shimbi Shoin advertised that this set (16 volumes) was limited to 500 sets in two grades. The ordinary edition (400 sets produced) with 130 color plates all on ordinary paper and the "edition de luxe" (100 sets produced) with 200 color plates and where the original was printed on silk, it is reproduced on silk in the deluxe edition. The deluxe edition is also characterized as having "rich brocade" covers. In a Shimbi Shion catalogue published ca 1910 the set was priced at �66 (deluxe) and �55 (regular). In a 1920 Shimbi Shoin catalogue the complete set was priced at 1,200 yen (deluxe) and 1,000 yen (regular). As of the 1920 catalogue the set is listed as 15 volumes ("or in folios"), not 16 volumes. In this catalogue the Japanese painting volumes were priced at 650 yen (deluxe) and at 525 yen (regular). In the 1922 catalogue the complete set was priced at 1,300 yen (deluxe) and 1,000 yen (regular). The 1922 catalogue states the deluxe edition has 200 color plates and the regular edition has 130 color plates. My review of deluxe editions of volumes I-XII confirmed 202 color woodblock plates. The set was issued in Japanese and English versions and in loose folio type format (boxed) and bound format. It appears that the 16th volume (History) was not issued for the Japanese version. The English language set on Japanese paintings (history volume + Volumes I-VII) with Japanese paintings is often offered without five volumes of Chinese paintings or the three volumes of sculptures. It is frequently referred to as the "Japanese Painting Series" of the set. For information on the Deluxe Edition of the eight volume Japanese paintings set (History and Volumes I-VII), click here. For information on the Deluxe Edition of the five volume Chinese paintings set (Volumes VIII-XII), click here. 1909-10, Shiichi Tajima, Nangwa Judaika-shu: Masterpieces by the Ten Masters of the Southern School, Shimbi Shoin, Tokyo, 1909-10, 2 volumes, folio, standard and deluxe editions, 16 color woodblock plates. 1910-? ?, Shiichi Tajima, Bijutsu Shuyei: Selected Masterpieces of the Old Painting, Sculpture, and Industrial Art of the Far East, Shimbi Shoin, Tokyo, 1909-? ?, 25 volume set, issued in installments, folio (19 1/4 x 13 1/2 in - 49 x 34.2 cm), bound Japanese style, crepe type paper over cardboard wraps, ribbon ties, 2 color woodblock prints tipped to plate and 8 black and white collotype plates in each volume. For more information on volumes 1 & 2, click here. 1910, Shiichi Tajima, Sesshu Gwasshu (Masterpieces by Sesshu), Shimbi Shoin, Tokyo, 1910, folio (19 1/2 x 13 3/8 in - 49.5 x 34 cm), decorated silk covers with beveled edges, tied with blue string, front cover with paste on title in Japanese, decorative silk covering on spine, top and bottom edges with gilt, 60 plates (11 color woodblock plates and 49 black and white collotype plates). For more information, click here. 1910, Shiichi Tajima, Sesshu Gwasshu Zokushu (Masterpieces by Sesshu, Supplement), Shimbi Shoin, Tokyo, 1909, standard and deluxe editions, folio, 45 plates, 9 of which are color woodblock prints. 1910, Shiichi Tajima, Sesshu Sansuigwa-jo (Album of Landscapes by Sessh�), Shimbi Shoin, Tokyo, 1910, standard and deluxe editions. Reported as a horizontal foldout format (38 x 20 cm). In the 1922 Shimbi Shoin catalogue listed as Sesshu Sansui-jo. 1910, An Illustrated Catalogue of Japanese Old Fine Arts Displayed at The Japan-British Exhibition London & An Illustrated Catalogue of Japanese Modern Fine Arts Displayed at The Japan-British Exhibition London, 1910, Tokyo, Shimbi Shoin, Compiled by The Office of the Imperial Japanese Government Commission to the Japan-British Exhibition, Shimbi Shoin, Tokyo, 1910, 8vo (7 1/4 x 10 1/4 in), a 2 volume set, floral cloth over paper cover, string bound, paper label front cover, top and bottom edges with gilt, a 2 volume set. Both volumes have similar paste on titles and title page. The two volumes catalogue the Japanese items displayed at the Exhibition. The art items on display at the exhibition are assigned numbers in the catalogues and listed in the text section of each volume. Many any of the items listed are depicted on the accompanying collotype plates with a brief descriptive title identification number which is referenced in the text section. The black and white collotype plates are printed on one side of the page and are on the same paper (thin) as used for the text pages. Between the two catalogues there are a total of 90 pages of text listing 700 exhibits with 525 of the items depicted on 324 pages of plates. The Japanese Old Fine Arts catalogue covers sculptures, models of old buildings, metal works which include hundreds of swords and sword guards which are consolidated in lots and lacquer wares. The Japanese Modern Fine Arts catalogue covers Japanese paintings, Western style paintings, sculptures, designs, woodcuts, pottery, cloisonne, metal works, dyed fabrics and embroideries, lacquer wares and inlaid wood-works. For more information on this two volume catalogue set, click here. 1910, Collection of Chinese Bronze Antiques, Shimbi Shoin, Tokyo, 1910, small folio (13 1/2 x 17 1/2 in), silk covers with paste on title label, string tied, 52 full page plates (some in color) protected by tissue guards with descriptive titles, with folding case. 1910, Lloyd, Rev. A. (translator), A Birthday Book of Japanese Verse, Old and New, by Many Authors, Shimbi Shoin, Tokyo, 1910, 8vo (12.5 x 19.5 cm), off-white decorated silk covers, gilt edges, unpaginated but ca 400 pages. The book contains one poem for each day of the year. 1910, Shiichi Tajima, Masterpieces by Sesshu, Shimbi Shoin, Tokyo, 1910. 1910, Kokuho Gajo: Japanese Temples and Their Treasures, Including Pictures of Buildings under Special Protection. Compiled by the Department of Education , Shimbi Shoin, Tokyo, 1910, 3 volumes boxed loose leaf, 29 x 39 cm, approximately 500 illustrations. 1910, Kankoch� (The Sakai Collection), Shimbi Shoin, Tokyo, 1910. 1910/1914, Kanroku Kubota, Tosogen Meigashu, Shimbi Shoin, Tokyo, 1910/1914, folio, 2 volumes, Chinese paintings, volume 1 Five Dynasties, Song Dynasty, volume 2, Song, Yuan Dynasties. Plates have descriptive (in Japanese) tissue guards. c1910, A Catalogue of Valuable and Important Japanese Art Publications, Shimbi Shoin, Tokyo (13 Shinsakana-cho, Kyobashiku), 68 pp. The catalogue has color woodblock front cover, inside front cover and back cover (seal of company in red). The catalogue prices 11 books/book series and six individual art reproductions in British pounds. Contains pictures of the business office, reception rooms and company woodblock artists at work. Also contains seven (7) full page plates (halftones) picturing the works listed. c1910, Calendar for 1911. The Shimbi Shoin published at least 17 calendars for 1911. They all carried the title "Calendar for 1911." There were 9 calendars in book format (most on plain paper) and 8 in hanging calendar format. These calendars are listed in a German catalogue published c1911 Ein Illustrierter Katalog �ber Einzelbl�tter Gem�de Postkarten, Tischkarten und Kalender (see above). To see the listing of these 17 items, click here. c1910, Calendar for 1911, Shimbi Shoin, Tokyo, c1910, 32mo (3 5/8 x 5 1/4 in - 9.2 x 13 cm), folded crepe pages, silk string tied, 10~16 pages (5~8 folded pages) including the covers. The calendars are presented one or two months per page. For more information on these items, click here or here According to Frederic A. Sharf, T. Hasegawa produced a series of 1911 calendars for the Shimbi Shoin. 1911, Shiichi Tajima, Shijoha Gwashu: Collection of Pictures by the Shijo School, Shimbi Shoin, 1911, 3 volumes, folio, ordinary and deluxe versions. Volume 1, 47 plates (25 color woodblocks - others black and white collotypes). Priced at 50 yen (deluxe edition) and 30 yen (ordinary edition) in 1920. 1911, Old Masters of the Far East Wood-cut Reproductions, Shimbi Shoin, Tokyo, 1911, 8vo (6 x 9 in -15.2 x 22.5 cm), 95 pages (89 numbered plus a 6 page unnumbered index). The catalogue lists, pictures (black and white) and prices, in shillings, numerous (ca 200) art reproductions the company has to offer. c1911, Ein Illustrierter Katalog �ber Einzelbl�tter Gem�de Postkarten, Tischkarten und Kalender, Tokio, Die Shimbi Shoin Gesellschaft, printed by W. & G. Baird Ges. Kunstrdurcker, London und Belfast, small 8vo (5 1/2 x 9 in - 14.2 x 22.6 cm), black and white halftone illustrations, card wraps with a lettering in silver and black on the front cover, 48 pp. A Shimbi Shoin sales catalogue of wood-cut reproductions, calendars and picture post cards/menu cards offered by Shimbi Shoin. While undated, the catalogue is dated to circa 1911 because it offers calendars for that year. A total of 319 items are listed, pictured and priced. Material listed includes color wood-cut reproductions (223 items), book format and hanging calendars for 1911 (17 items - see calendar list here) and picture post cards and menu cards (79 items - see card list here). The wood-cut reproductions are listed in the following categories which have been assigned alpha and numerical prefixes by the Shimbi Shoin: "Buddhistiche Figuren" (A1-A18), "Blumen und Vogel (B1-B82), "Landschaften und Menschliche Figuren" (C1-50) and "Populare Schule" (D1-73). The "Populare Schule" wood-cut illustrations are from the Ukiyoye School. c1911, Catalogue Illustre de Gravures en Couleurs Reproduisant de Peintures Anciennes du Japon Presentees sous Forme de Tableaux, de Cartes-Postales, de Cartes-Menues, De Calendriers, Etc., Par La Shimbi Shoin Society d'Impressons Artistiques de Tokyo, Tokyo, bears the imprint of Succursale A. Londres, 104 Hight Holborn, W.C., small 8vo (5 1/2 x 9 in - 14.2 x 22.6 cm), black and white halftone illustrations, card wraps with a lettering in silver and black on the front cover, staple bound, 48 pp. A Shimbi Shoin sales catalogue of wood-cut reproductions, calendars and picture post cards/menu cards offered by Shimbi Shoin. While undated, the catalogue is dated to circa 1911 because it offers calendars for that year. A total of 320 items are listed, pictured and priced. Material listed includes color wood-cut reproductions (223 items), book format and hanging calendars for 1911 (17 items) and picture post cards and menu cards (80 items). The wood-cut reproductions are listed in the following categories which have been assigned alpha and numerical prefixes by the Shimbi Shoin: "Peintures Bouddhiques" (A1-A18), "Fleurs et Oiseaux (B1-B82), "Paysages et Personnages" (C1-50) and "Tableaux Populaires" (D1-73). The "Tableaux Populaires" wood-cut illustrations are from the "Oukiyoye" School. To see the front cover, click here. c1911, Verzeichnis von Monumentalen Publikationen, Chinesischer und Japanischer Kunstwerke, Shimbi Shoin, Verlag, Tokyo, bears the imprint of W. & G. Baird Ltd, London and Belfast, paper wraps, staple bound, small 8vo, undated but ca 1911, text in German, prices in DM, no illustrations, 16 pp. Pages 2-3 are a discussion of the Shimbi Shoin. Pages 4-10 contain a price list of 13 Shimbi Shoin books/book sets. All were first marketed before 1911. The book lists Shimbi Shoin awards with the last one being from a 1910 event in London. Pages 10-13 contains a price list of "Einzelreproduktionen alter Gemalde und Makimono" (13 items listed). Pages 13-4 contains a price list of "Grosse Photographein nach Japaniscen Skulpturen" and lists 20 items. Page 14 lists one item titled "Einzelblatter" and one item titled "Werk Uber die Technik Des Frarbenholzschnittes." Pages 15-16 contains a price list "Uverkaufliche Kopien" and lists 3 items with the last containing 6 sub-listings. To see the covers and representative pages, click here. 1912, Seigaku Gwashu (Star Hill Collection), Tokyo, The Shimbi Shoin, 1912, large 4to (15 1/4 x 10 1/2 in - 38.8 x 27.2 cm), silk covered boards with paste on title on front board (reads Japanese style, back to front), edges beveled, spine covered in decorated silk cloth, purple silk ties, gilt top and bottom edges, text in Japanese and English, Japanese & English forwards, 67 plates reproducing 72 paintings. There are 7 color wood-cut plates and 60 black and white collotype plates. All plates are on thick high quality paper stock. The wood-cuts are tipped to plate. The book reproduces paintings found in the collection in the Kita-in Temple (Star Hill Collection) near Tokyo. The plates are presented in three sections. Each section is preceded by a tissue guard with brief descriptive information in Japanese and English. The three sections are: 1) Pictures of Various Workmen (24 plates) attributed to Kano Yoshinobu, 2) Portraits of the Six-and-Thirty Master Poets by Matabei Iwasa (36 plates) and, 3) Twelve Varieties of Hawk-Pictures (7 plates). Five of the Hawk-Picture plates have two images each. For more information on this book, click here. 1912, Hikko-En (Classical Chinese Painting), Shimbi Shoin, Tokyo, 1912. 1913, Naohiko Masaki, One Hundred Masterpieces of Japanese Pictorial Art Selected by Members of the Faculty of the Tokyo Fine Art School, Shimbi Shoin, 2 volumes, folio (19 1/2 x 13 1/2 in - 49.5 x 34 cm), silk covered boards, 100 plates in color and monochrome, pictorial cloth boards, black on bronze, paper labels on front covers, sold with clasped chitsu case for each volume. Introduction of 23 pages, 100 plates (24 in color), with captions on tissues and 2 plates are fold-outs of three-leaves. For more information on this edition, click here. Earlier edition in 1909. 1913, Tsunahiro Wada & Toranosuke Furukawa, Tsuba to Kodogu: Furukawa zo (The Furukawa Sword Guard and Sword Ornaments Collection), Shimbi Shoin, Tokyo, 1913, folio, 76 collotype plates, 33 text pages, silk covered boards. This is private printing and not distributed directly to the public. Printed in Japanese and English versions. Reported to be limited to 100 copies. The Japanese version has a 320 page companion book also printed by Shimbi Shoin. The companion books is a study of Japanese sword fittings also by Tsunahiro Wada. 1913, Japan Fine Arts Association, Sotatsu-Gwashu - The Collection of the Works by Sotatsu, Shimbi Shoin, Tokyo, 1913, folio, 50 plates, standard and deluxe editions. For more information on the ordinary/standard edition, click here. 1913 & 1914, Imperial Japanese Government Railways, An Official Guide to Eastern Asia, Trans-Continental Connections Between Europe and Asia - Volume II, South-Western Japan & Volume III, North-Eastern Japan, Tokyo, Tokyo Tsukiji Type Foundry. Each of these travel guides contain one color woodcut plate by the Shimbi Shoin. To see the plate in Volume III, click here. For more information on the complete 5 volume set, click here. 1914, Kubota Kanroku, Bunjinga Santaika-Shu, Shimbi Shoin, Tokyo, 1914 (Taisho 3), reprint of 1909 1st edition, folio, silk covers and silk title label, 48 plates (37 collotype and 11 color wood-cut). Reproductions of paintings by the "Three Masters" of Japanese painting: Tanomura Chikuden, Watanabe Kazan, and Yosa Buson. In a 1920 sales catalogue, the company states the book has 54 plates with no mention of a deluxe edition. However, forty-eight appears to be the correct number of plates and a deluxe edition was sold. 1914, Old Masters of the Far East Wood-cut Reproductions, a sales catalogue, Shimbi Shoin, Tokyo, 1914, 8vo, color woodblock tipped to front cvoer, black and white halftone illustrations, 91 pp. The Shimbi Shoin lettering system is used. Approximately 245 items are pictured, numbered, described and priced in yen. Most are in the 3 yen range. However large size versions (x2 the regular size - ca 33 x 14 in) of color prints on silk are priced as high as 20 yen each. Normal size (ca 14 x 7 in) color prints on silk are generally 10% more than the same print on paper. Categories are: Buddhistic and Human Figures ("A" nos. - 25 items), Flowers and Birds ("B" nos. - 83 items), Landscaptes ("C" nos. - 34 items), Genre Pictures ("D" nos. - 42 items), Chinese Pictures ("E" nos. - 46 items) and Reproductions of Old Prints ("F" nos. - 15 items, some representing sets of up to 12 prints.). To see the front cover, click here. 1914, An Official Guide to Eastern Asia Trans-Continental Connections Between Europe and Asia, Volumes II (South-Western Japan) and III (North-Eastern Japan) each contain a color woodblock plate by Shimbi Shoin. For more information on this set, click here. 1915, Japanese Temples and Their Treasures edited by His Imperial Japanese Majesty's Commission to the Panama-Pacific International Exposition, Shimbi Shoin, Tokyo, 1915, 3 volumes. 1915, Japan Fine Arts Association, Koetsu-ha Sanmeika-shu (Selected Masterpieces by the Three Artists from the Koetsu School), Shimbi Shoin, Tokyo, 1915, 5 color plates, hard cover. A Japanese version with no color plates and soft covers has also been reported. 1915-1918, Geien Shinsho: Selected Masterpieces of Paintings, Sculptures, and Industrial Arts of the Orient, Shimbi Shoin, Tokyo, 1915-1917, cardboard covers with silk ties, notes in English and Japanese, folio (34 x 50 cm), each part with 8 to 9 black and white collotypes and one color woodblock. Issued in 12 parts with a total 90 pages of text and 106 leaves of plates (1 folding). Part I (July 1915), Part IV (July 1916), Part V (September 1916), Part VII (June 1917), Part IX (August 1917) and Part XII (September 1918) have been confirmed. In 1920 the Shimbi Shoin marketed the set of 12 parts at 5 yen each. c1916, Process of Wood-Cut Printing Explained, Tokyo, Shimbi Shoin, Ltd, c1916, 16mo (5 x 6 1/2 in) ribbon stab ties, stiff wraps with a color woodcut on the front cover, 44 pp (4 page introduction and 40 pages of woodcuts), no colophon. The woodcut pages were printed on single sheets and then joined along the outside edge with glue. A step by step illustrated guide to how color woodcut prints are made. Using a single print ("Two Beauties in a Boat" by Kiyonaga) as the basis for the guide, as you go through the book a color woodblock (woodcut) print progresses through it's various manufacturing stages to become a completed image. Each color (even shades of the same color) requires a different block and this is demonstrated step by step. The book contains a 4 page (double folded pages) introduction and the balance consists of 20 woodcuts on the left page and the resulting cumulative state of the woodblock print on the right page. The introduction is printed on thinner paper than the pages with the actual woodblock illustrations. The woodcuts are printed on thick high quality tannish hosho paper. Earlier versions of this book were published. 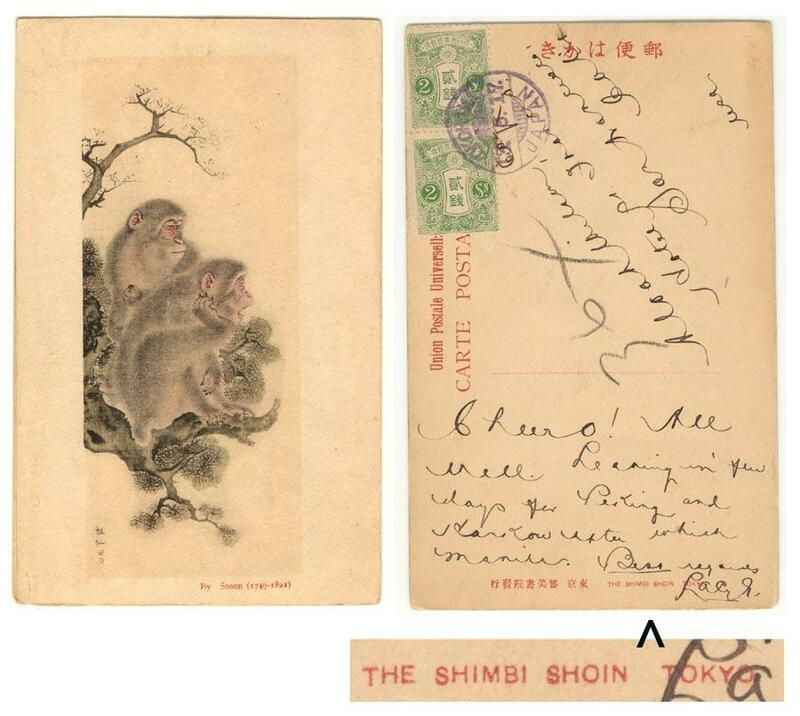 One had a stated printing date of March 10th of Meiji 40 (1907) and another with no date stated (see c1920 below). For more information on this book, click here. 1917, Japan Photo Album of Military Maneuvers, Shimbi Shoin, Tokyo, 1917 (Taisho 5), 4to (26.5 x 35 cm), 50 plates (from photographs), gold color silk binding with gold sprinkled endpapers, in cloth box. The plates depict military maneuvers of cavalry and artillery units. This is one of the few books published by Shimbi Shoin that was not a art reproduction book. 1918, Omura Seigai & Katano Shiro, et al, Ukiyo-e Ha Gashu, (Pictures by Utagawa School), 5 volumes, with color woodcuts, 1918, folio (49.5 x 34 cm), Shimbi Shoin. c1918, Japanese Fine Arts Association, Catalogue for Fine Arts Exposition at Tokyo, 1918 (translation, title in Japanese), 6 text pages, 117 (82 and 35) black and white plates, stiff wraps illustrated with color woodblock print, stab ties, Shimbi Shoin. 1918-19, Shiichi Tajima, Masterpieces Selected From the Fine Arts of the Far East and History of Japanese Pictorial Art (T�y� Bijutsu Taikwan), 2nd edition, Shimbi Shoin, Tokyo, 1918-199, folio, 15 (16) volumes. For more information on this set, see the 1st edition, 1909-10, above. 1919, Old Masters of the Far East, Wood-cut Reproductions, Tokyo (13 Shinsakanacho Kyobashiku), Shimbi Shoin, Ltd, 8vo (6 x 8 3/4 in - 15 x 22.3 cm), a sales catalogue of wood-cut reproductions offered by Shimbi Shoin, paper wraps with a color woodcut on front cover, 290+ reproductions are pictured in black and white (1-4 per page) and offered for sale, generally at 2.50 yen ~ 3.50 yen each, 106 pp. Items are listed by subject and artist with size in inches given. All the reproductions are in color and some are offered on silk or paper. In rare instances the prints or offered in different sizes. Items are grouped under the categories of 1) Buddhistic and Human Figures, 2) Flowers and Birds, 3) Landscapes, 4) Genre Pictures, 5) Chinese Pictures and 6) Reproductions of Old Prints. There is a 6 page index that lists artist and print subject. Where the artist is unknown, the item is listed by subject. 1920, Valuable and Important Japanese Art Publications, Shimbi Shoin, Ltd, Tokyo, paper wraps, 8vo, 56 pp. Pages 1-51 are a price list of books available. Pages 52-56 list single sheet reproductions of art. These reproductions are offered in various formats (mounted with "damask silk on ivory axles," unmounted on paper and unmounted print on silk). 1920, Process of Wood-Cut Printing Explained (Lady Fishing), Tokyo, The Shimbi Shoin, 1920, large 18mo (4 7/8 x 6 1/4 in) string tied, stiff wraps with a color woodcut on the front cover, 44 pp (4 page introduction printed on two folded sheets and 40 pages of woodcuts). The woodcut pages are printed on single sheets and then joined along the outside edge with glue. A step by step illustrated guide to how color woodcut prints are made. Using a single print (Ukiyoye school, lady fishing) as the basis for the guide, as you go through the book a color woodblock (woodcut) print progresses through the various manufacturing stages to become a completed image. Each color (even shades of the same color) requires a different block and this is demonstrated step by step. The book contains a 4 page introduction (printed on 2 folded pages) and the balance consists of 20 woodcuts on the left page and the resulting cumulative state of the woodblock print on the right page. The introduction is printed on thinner paper than the pages with the actual woodblock illustrations. The woodcuts are printed on thick high quality tannish hosho paper. The book is dated to 1920 by the date of "January 10, 1920" found on the 4th page of the introduction. There is no colophon in this book. The front cover of the book is the woodblock print in the final state as shown on the 40th page of the book. For more information on this book, click here. 1920, Process of Wood-Cut Printing Explained (2 Ladies in a Boat), Tokyo, Shimbi Shoin, Ltd, c1920, 16mo (5 x 6 1/2 in) string tied, stiff wraps with a color woodcut on the front cover, 44 pp (4 page introduction and 40 pages of woodcuts), no colophon. The woodcut pages were printed on single sheets and then joined along the outside edge with glue. A step by step illustrated guide to how color woodcut prints are made. Using a single print ("Two Beauties in a Boat" by Kiyonaga) as the basis for the guide, as you go through the book a color woodblock (woodcut) print progresses through it's various manufacturing stages to become a completed image. Each color (even shades of the same color) requires a different block and this is demonstrated step by step. The book contains a 4 page (double folded pages) introduction and the balance consists of 20 woodcuts on the left page and the resulting cumulative state of the woodblock print on the right page. The introduction is printed on thinner paper than the pages with the actual woodblock illustrations. The woodcuts are printed on thick high quality tannish hosho paper. Earlier versions of this book were published. One had a stated printing date of March 10th of Meiji 40 (1907) and another March 10, 1916. Other versions of the book during the period of ca 1920~1938 have been confirmed. For more information on this book, click here. 1922, Valuable and Important Japanese Art Publications, Shimbi Shoin, Ltd, Tokyo (13 Shinsakana-cho, Kyobashiku), paper wraps, 54 pp. The catalogue has black and white woodblock front cover. The catalogue prices 25+ books/book series and 22 individual art reproductions in yen. Since this catalogue is published after most of the company's major works were completed, the summaries of the various publications/works offered are more precise than in many earlier catalogues which often published "anticipated" summaries of works. 1923, Baron Henpei Kondo, The Hi-Ko hen-ei. Memorials of Travel : Verses in Chinese by the Late Baron Henpei Kondo, and Chinese Paintings Reproduced from Originals in His Collection, Edited by his Son Baron Shigeya Kondo, Shimbi Shoin, 37 plates, issued with slip case. 1923. The Shimbi Shoin was severely impacted by the Great Kanto Earthquake which struck on September 1, 1923. The Shimbi Shoin facilities were destroyed and probably most of the stock on hand and printing blocks. I have found no comments that outline in detail the impact of the disaster on the company. However, the below general comments were recorded less than a year later. A review of the output of the Shimbi Shoin after the earthquake of 1923 supports the conclusion that its operations were severely curtailed and it never returned to the grand multi-volume projects of prior years. c1924, various folios of plates, some with cases. c1924, folio of 5 color woodcut reproductions with folding case. Reproductions are D No. 11 By Fujimaro (18th-19 Century), D No. 17 Kiyomoto (17th Century), D No. 22 By Sukenobu (1671-1751), D No. 28 By Shunman (1757-1820) and D No. 30 By Utamaro (1753-1805). For more information on this unit, click here. For a unit of 22 plates, click here. To see a unit of 24 plates, click For a unit of 24 plates, click here. 1925, Kubota, Kanroku (editor), Thirty Masterpieces of Modern Japanese Pictorial Art (Tokugawa Period), Shimbi Shoin, Tokyo, September, 1925, folio (19 1/2 x 13 1/4 in - 49 x 33.8 cm), brown silk covers with beveled edges, tied with purple string, front cover with paste on Japanese title, decorative silk covering on spine, top and bottom edges in gilt, plain front and end papers, 30 plates (ten color woodblock plates and twenty black and white collotype plates). For more information on this book, click here. 1925, Old Masters of the Far East, Wood-cut Reproductions, a sales catalogue, Tokyo (3 Shinsakanacho, Kyobashiku), Shimbi Shoin, Ltd, 8vo (6 x 8 3/4 in - 15 x 22.3 cm), paper wraps, 55 pp. A listing of 135 wood-cut reproductions offered for sale by Shimbi Shoin. Each work is pictured and described (title - artist if known - size - if in color) and priced (generally 1 yen to 5 yen per item). Cover states "Price One Yen" and bears the date of 1925. 1926, Tangen Gassh� (Selected paintings by Kan� Tangen), Shimbi Shoin, Tokyo, 1926. 1927-31, Harada Jiro (editor), Inouye Kiyoshi (editor), color reproductions of items in the Imperial Household Collection and Shosoin Collection. Presented in a series of plate folios. Thus far 10 plate folios have been confirmed. The folios usually contain 4-5 numbered plates. Folio No. 9, published in 1928, is titled Gomotsu Jodai Senshokumon, Sixth to Eight Century A.D. Dyed and Textile Fabrics in the Imperial Household, Tokyo, published by the Tokyo Imperial Household Museum, sole agent Shimbi Shoin, Ltd (13 Shinsakanacho, Kyibashiku, Tokyo), folio. It contains four color plates reproducing fabrics. The plates are housed in cardboard folding cases (19 x 13 1/2 in). Each plate is accompanied by a sheet with Japanese and English descriptive information. For information on Folio No. 9, click here. 1928, Old Masters of the Far East, Wood-cut Reproductions, 8vo, 78 pp. A sales catalogue. Black and white woodblock print of a crane over a pine tree front cover and color woodblock tipped to the inside of the back cover (one woman). Lists and prices over 190 individual woodcut prints (reproductions of famous prints). Each listing includes the original artist, subject of print, size and price (in yen). On books is listed. It is titled Process of Wood-Cut Printing Explained (20 plates, 9 x 14 cm - 2 yen) using "Two Beauties in a Boat" by Kiyonaga. 1932, Lafcadio Hearn, Kwaidan, Stories and Studies of Strange Things by Lafcadio Hearn with an introduction by Oscar Lewis, Tokyo, "Printed for Members of the Limited Editions Club by the Shimbi Shoin, Ltd.," 1932, 8vo (6 x 8 1/4 in - 21 x 15.2 cm), bound Japanese style with string ties which pass over the uncovered spine at 4 places and the top and bottom adjacent to the spine, silk covered folding case with paste on label and ivory/bone pegs, brocade cloth covers with a repeating pattern composed of eight golden clouds, top edge gilt, side and bottom edges untrimmed, handmade paper with the "Kwaidan" watermark, tissue guard protected title page, limitation statement at the rear (limited to 1500 copies), no copyright notice, introduction (ii-xvi), preface (2 pages), table of contents (2 pages), 2 color woodblock frontispieces (1 is double page), 20 collotype plates, illustrations by Yasumasa Fujita, 238 pp. For more information on this book, click here. 1932, Old Masters of the Far East, Wood-cut Reproductions, a sales catalogue, Shimbi Shoin, Tokyo (3 Ginza Nishi-Sanchome, Kyobashiku), Shimbi Shoin, Ltd, 8vo (6 x 9 in), paper wraps, 62 pp. Each reproduction offered for sale is pictured and information regarding artist, size of the reproduction and price (in yen) provided. Over 210 reproductions are pictured. The items are reproduced in the catalogue in black and white collotype. Inside the back is a "Specimen of Menu and Post Cards" in color woodblock. To see the covers and color woodblock print, click here. 1932, business card, found loose in the 1932 sales catalogue, above, click here. 1932, ? title ?, 30 color woodblock reproductions, large 8vo. 1934, Masterpieces in the Imperial Fine Art Exhibition, 1934, Shimbi Shoin Ltd, "Issued by "Tokyo-Fu" (Tokyo Prefecture), 8vo (7 1/2 x 10 1/2 in -- 19 x 26.3 cm), 151 black and white collotype plates reproducing various art works, text in Japanese and English, decorated maroon cloth, two string ties, 151 pages plus a 5 page appendix in Japanese text at the back after the colophon. It appears the book was specially prepared for presentation to "Representatives of the XVth international Conference of the Red Cross Held in Tokyo, October 29th, 1934." It has a page before the title page stating "Presented by Mr. Masayasu Kosaka, Governor of Tokyo-fu." For more information on this book click here. 1935, Old Masters of the Far East, Wood-cut Reproductions, 8vo (6 x 9 in - 15.2 x 23 cm), 68 pp. A sales catalogue. Color woodblock print of three cats and flowers on the front cover and one (tipped in) inside the back cover. Lists and prices over 219 individual woodcut prints. One book is listed also. This book is titled Process of Wood-Cut Printing Explained (20 plates, 9 x 14 cm - 2 yen) using "Two Beauties in a Boat" by Kiyonaga. An image of this book advertisement is here. The book listing is followed by a listing for picture frames (51-35 cm) and a cover case (wrap-around case). A.  Buddhistic and Human Figures, A1//A45 (28 items). B. Flowers and Birds, B1//B110 (60 items). C.  Landscapes, C1//C48 (25 items). D.  Genre Pictures, D1//D67 (63 items). E.  Chinese Pictures, E2//E52 (31 items). 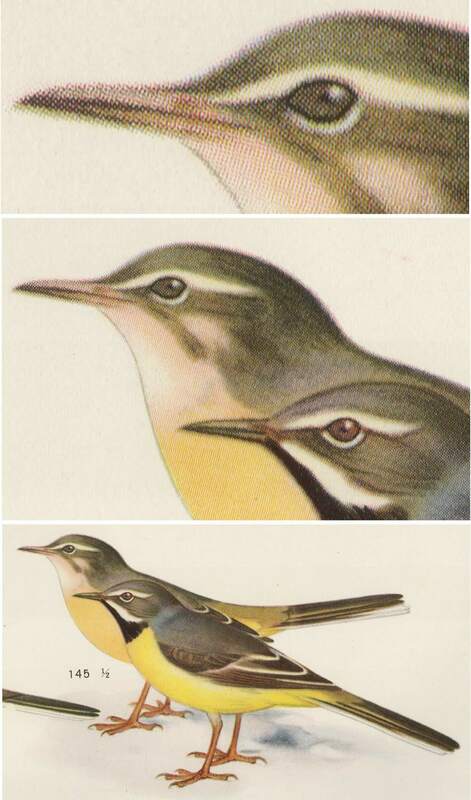 F.  Reproductions of Old Prints, F1//F17  (12 items, 2 are sets of 4 prints). To see the cover, title page and representative pages, click here. 1936, Josui Oshikawa & Hazel H. Gorham, Manual of Japanese Flower Arrangement, copyrighted 1936 by the Nippon Bunka Renmei (The Nippon Cultural Federation), printed by Shimbi Shoin, Ltd., Tokyo, red cloth with gilt lettering and decoration, pictorial endpages, dust jacket and cardboard slip case, 322 pp. 1937, Old Masters of the Far East, Wood-cut Reproductions, 8vo, 70 pp. A sales catalogue. Color woodblock print of Fuji on the front cover and one inside the back cover (two women). Lists and prices over 230 individual woodcut prints. Each listing includes the original artist, subject of print, size and price (in yen). Two books are listed also. The first, Multi-Colored Wood Blocks (30 plates, 15 x 25.5 cm, 5 yen) explains the woodcut printings process using the print "Beauty Playing with a Cat" by Katsukawa Shunsho. The other book is titled Process of Wood-Cut Printing Explained (20 plates, 9 x 14 cm - 2 yen) using "Two Beauties in a Boat" by Kiyonaga. The later book appears to be a condensed version of the book with the same title listed c1920, above. 1937, Josui Oshikawa & Hazel H. Gorham, Introduction to Japanese Flower Arrangement, Shimbi Shoin, 8vo (7 1/2 x 10 in - 19 x 25 cm), bound Japanese style with two ribbon ties, paper wraps with front cover illustrated with a color illustration, 13 black and white collotype plates showing flower arrangements, numerous text illustrations/line drawings, 41 pp. The front and back covers are double fold pages with gold spackle design on the inside of the cover. The introduction states that this book is addition to a manual the authors have already published and the purpose is "...to give you a little idea of the value to you of Japanese flower arrangement in rousing your interest in flowers of your own garden and country." To see the front cover and examples of the illustrations, click here. c1937, Japansese flower arrangements, Shimbi Shoin, not dated but ca 1937, 12mo, six folders each containing five loose black and white collotype plates of flower arrangements. Each cover has a different title. For more information on these plates, click here. 1938, Hazel H. Gorham, Comparison of Occidental and Oriental Concepts of Flowers and Gardens, Shimbi Shoin, 4to, green wraps with pictorial label, one plate, 18 pp. 1938, Hazel H. Gorham, Tray Gardens, Symbol of the Permeation of Culture, Shimbi Shoin, 4to, dark green wraps with pictorial label, one plate, 22 pp.
? ?, Nippon Kendo to Seiyo Kengi, Shimbi Shoin, Ltd, ca 1937, unconfirmed. Japanese and Western fencing. Valuable and Important Japanese Art Publications, The Shimbi Shoin, 13 Shinsakano-cho, Kyobashi-ku, Tokyo, no publication date.
? ?, Toyei Shuko, An Illustrated Catalogue of the Imperial Treasury Called Shosoin, at Nara, Tokyo (No 13, Shinsakano-cho, Kyobashi-ku), Shimbi Shoin, Ltd, compiled by the Department of Imperial Household, folio, 3 volumes, 200 plates, deluxe and ordinary editions.
? ?, Kokuho Gajo, Japanese Temples and Their Treasures (Including Pictures of Buildings Under Special Protection), Tokyo (No 13, Shinsakano-cho, Kyobashi-ku), Shimbi Shoin, Ltd, compiled by the Department of Home Affairs, folio, 3 parts, folio, loose plates in folding covers, approximately 500 plates.
? ?, [ca 1910] Toyo Bijutsu Taikwan, Masterpieces Selected from the Fine Arts of the Far East, Tokyo (No 13, Shinsakano-cho, Kyobashi-ku), Shimbi Shoin, Ltd, folio, 15 volumes, 7 volumes for Japanese pictures (485 plates), 5 volumes of Chinese pictures (307 plates) and 3 volumes of Sculptures (215 plates) for a total of 1,070 plates. Limited to 500 sets in two grades. The ordinary edition has 130 color plates all on ordinary paper and the deluxe edition has 200 color plates and where the original was printed on silk, it is reproduced on silk in the deluxe edition. In a Shimbi Shion catalogue published ca 1910 the set was priced at �66 (deluxe) and �55 (regular). In a 1920 catalogue the complete set was priced at 1,300 yen (deluxe) and 1,000 yen (regular). ?? [1899-1908], S. Tajima, Shimbi Taikwan, Selected Relics of Japanese Art, Tokyo (No 13, Shinsakano-cho, Kyobashi-ku), Shimbi Shoin, Ltd, folio, 20 volumes, 50 plates per volume, total of 1,000 plates, deluxe and ordinary editions. ?? [ca 1910], Charicatures of Birds and Beasts By Toba Sojo (12th Century), Tokyo (No 13, Shinsakano-cho, Kyobashi-ku), Shimbi Shoin, Ltd, 3 rolls, each roll is ca 40 feet long and 1 foot wide, covers are silk brocade, offered with a Paulownia-wood case as an accessory. Designated as Famous Picture Roll Series No. 1. In ca 1910 sold for �8 and 100 yen in 1920.
? ?, [ca 1910], Long Roll of Landscape Paintings by Sesshu (1420-1506), Tokyo (No 13, Shinsakano-cho, Kyobashi-ku), Shimbi Shoin, Ltd, 1 roll ca 14 3/4 inches wide by 50 feet long. Offered with a Paulownia-wood case as an accessory (14 3/4 x 9 1/4 x 4 3/8 in). Designated as Famous Picture Roll Series No. 2. 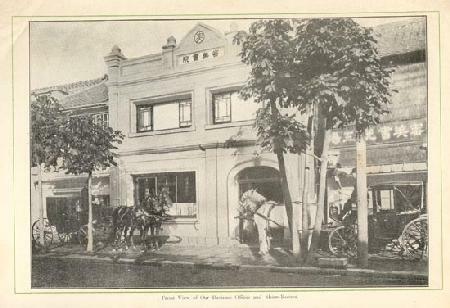 In ca 1910 sold for �2.10s and 30 yen in 1920.
? ?, [ca 1910], Sesshu Sansui Sho-Chokwan: The Smaller Long Roll of Landscape Paintings by Sesshu, Tokyo (No 13, Shinsakano-cho, Kyobashi-ku), Shimbi Shoin, Ltd, 1 roll. Sold in a Paulownia-wood case. Priced at 30 yen in 1920.
? ?, Sixteen Arhats by Zengetsu Daishi (d. 912), Tokyo (No 13, Shinsakano-cho, Kyobashi-ku), Shimbi Shoin, Ltd, folio, 16 plates. Priced at 20 yen in 1920.
? ?, Sesshu Gwashu: Masterpieces by Sesshu (1420-1506), Tokyo (No 13, Shinsakano-cho, Kyobashi-ku), Shimbi Shoin, Ltd, folio, ca 50 plates, offered in deluxe edition and ordinary edition. Priced at 60 yen (deluxe) and 50 yen (ordinary) in 1920.
? ?, Koetsuha Sanmeika-Shu: Selected Masterpieces by the Three Artists from the Koetsu School, Tokyo (No 13, Shinsakano-cho, Kyobashi-ku), Shimbi Shoin, Ltd, folio, 51 plates, offered in ordinary edition. The Japan Fine Arts Association selected the subjects which were 38 sheets of pictures, 7 sheets of gold lacquered works, 3 sheets of porcelains and 3 sheets of hand-writings. Priced at 45 yen in 1920. Five plates are color woodblocks and the balance are black and white collotypes. Priced at 45 yen in 1920.
? ?, Sesshu Sansui-Jo: Album of Landscapes by Sesshu (1420-1506), Tokyo (No 13, Shinsakano-cho, Kyobashi-ku), Shimbi Shoin, Ltd, folio, 22 plates, offered in deluxe edition and ordinary edition. Priced at 50 yen (deluxe) and 45 yen (ordinary) in 1920.
? ?, [ca 1910] Motonobu Gwashu: Masterpieces of Montonobu (1476-1559), Tokyo (No 13, Shinsakano-cho, Kyobashi-ku), Shimbi Shoin, Ltd, folio, ca 50 plates, all in collotype. Priced at 30 yen in 1920.
? ?, Korin-Ha Gwashu: Masterpieces Selected from the Korin School, Tokyo (No 13, Shinsakano-cho, Kyobashi-ku), Shimbi Shoin, Ltd, folio, 3 volumes, ca 120 plates (colored wood-cuts and collotypes), offered in deluxe edition and ordinary edition. Priced at 250 yen (deluxe) and 200 yen (ordinary) in 1920.
? ?, Maruyama-Ha Gwashu: Masterpieces Selected from the Maruyama School, Tokyo (No 13, Shinsakano-cho, Kyobashi-ku), Shimbi Shoin, Ltd, folio, 48 plates of which 38 are color (color wood-cuts and collotypes). Priced at 80 yen in 1920.
? ?, Ukiyoye-Ha: Masterpieces Selected from the Ukiyoye School, Tokyo (No 13, Shinsakano-cho, Kyobashi-ku), Shimbi Shoin, Ltd, folio, 5 volumes, 170 plates (color wood-cuts & 12 black and white collotypes), reproducing 160 masterpieces, offered in deluxe edition and ordinary edition. Priced at 500 yen (deluxe) and 400 yen (ordinary) in 1920.
? ?, Sotatsu-Gwashu: The Collection of Works by Sotatsu, Tokyo (No 13, Shinsakano-cho, Kyobashi-ku), Shimbi Shoin, Ltd, folio, 50 plates, offered in deluxe edition and ordinary edition. In the ordinary edition all the plates are black and white collotypes. In the deluxe edition, 4 plates are color woodblocks on a gold background. An exhibition of Sotatsu's work was held in the Spring of 1913. The Japanese Fine Arts Association selected the best 28 subjects and they are reproduced in this album. Priced at 45 yen (deluxe) and 20 yen (ordinary) in 1920. ?? [1912, 1919], Nihon Meigwa Hyakusen: One Hundred Masterpieces of Japanese Pictorial Art (Introduction by Professor Masaki, Director of Tokyo Imperial Fine Art School), Tokyo (No 13, Shinsakano-cho, Kyobashi-ku), Shimbi Shoin, Ltd, folio, 2 volumes, 100 plates. Priced at 100 yen in 1920.
? ?, Bunjingwa Sandaika-Shu: Selections from the Three Bunjingwa Schools, Tokyo (No 13, Shinsakano-cho, Kyobashi-ku), Shimbi Shoin, Ltd, folio, 54 plates. Priced at 50 yen in 1920. 1912, Nanso Meigwaen: Celebrated Pictures of the Southern School, Tokyo (No 13, Shinsakano-cho, Kyobashi-ku), Shimbi Shoin, Ltd, folio, 1912 revised edition, 25 volumes, 250 black and white collotype plates (each volume with 10 collotype plates). Priced at 95 yen in 1920.
? ?, Nangwa Jutaika-Shu: Masterpieces of the Ten Masters of the Southern School, Tokyo (No 13, Shinsakano-cho, Kyobashi-ku), Shimbi Shoin, Ltd, folio, 2 volumes, 120 plates, offered in deluxe edition and ordinary edition. Priced at 100 yen (deluxe edition) and 75 yen (ordinary edition) in 1920.
? ?, Isso Hyakutai: One Hundred Customs and Costumes by Kwazan (1793-1841), Tokyo (No 13, Shinsakano-cho, Kyobashi-ku), Shimbi Shoin, Ltd, folio, 59 plates. Priced at 20 yen in 1920. ?? , Shina Kodoki-Shu: Collection of Chinese Bronze Antiques, Tokyo (No 13, Shinsakano-cho, Kyobashi-ku), Shimbi Shoin, Ltd, folio, 52 plates (3 of which are wood-cuts).
? ?, S. Tajima, Bijutsu Shuyei, Tokyo (No 13, Shinsakano-cho, Kyobashi-ku), Shimbi Shoin, Ltd, folio, 25 volumes. Each volume contains 8 collotype monochrome plates and 2 wood-cuts in color.
? ?, The "Hikko-En": The Classical Chinese Painting, Tokyo (No 13, Shinsakano-cho, Kyobashi-ku), Shimbi Shoin, Ltd, folio, 60 plates. Priced at 60 yen (deluxe edition) and 50 yen (ordinary edition) in 1920.
? ?, Seigaku-Gwashu (Star Hill Collection), Tokyo (No 13, Shinsakano-cho, Kyobashi-ku), Shimbi Shoin, Ltd, folio, 67 plates (7 colored and 2 on gold background), offered only in deluxe edition. Priced at 25 yen in 1920.
? ?, Koshin Gwajo: Album of Pictures by Hung-Sheng, Tokyo (No 13, Shinsakano-cho, Kyobashi-ku), Shimbi Shoin, Ltd, folio, "a series of twelve books with an outer cover," color wooblocks "throughout." Priced at 18 yen in 1920.
? ?, Bijutsu Shuyei, Tokyo (No 13, Shinsakano-cho, Kyobashi-ku), Shimbi Shoin, Ltd, folio, 25 volumes, each ordinary volume with 8 black and white collotypes and 2 color woodblocks. Priced at 6 yen each volume, 140 yen for the set in 1920.
? ?, Gei En Shin Sho: Selected Masterpieces of Paintings, Sculptures, and Industrial Arts of the Orient, Tokyo (No 13, Shinsakano-cho, Kyobashi-ku), Shimbi Shoin, Ltd, folio, 12 volumes, each with with 9 black and white collotypes and 1 color woodblocks. Priced at 5 yen each volume, 60 yen for the set in 1920.
? ?, Kogyo Gwafu: Album of Masterpieces by Kogyo (continuation), Tokyo (No 13, Shinsakano-cho, Kyobashi-ku), Shimbi Shoin, Ltd, folio, 13 color woodblocks, 17 three color prints (woodblocks?) and 85 black and white collotypes. Described as a sequel to the first album of the artist's pictures. Priced at 16 yen in 1920.
? ?,  Old Masters of the Far East, An Illustrated Catalogue of Wood-Cut Reproductions, Tokyo (No 13, Shinsakano-cho, Kyobashi-ku), Shimbi Shoin. Confirmed Shimbi Shoin Address as Listed in Books (earliest and latest confirmed dates shown). Shiki no Hana (Flowers of the Four Seasons), 2 volumes. 1916, 32 pages with double & single-page woodblock printed illustrations, reproductions of the works of Tamaro, Kitagawa. Ehon Butai Ogi (Portraits of Edo Actors on Fans), 3 volumes, 1917, 121 portraits of actors, originally published in 1770, reproductions of the works of Shunsho, Katsukawa & Buncho, Ippitsusai. Ehon Azuma Warawa (Picture Book of the Children of Edo), 2 volumes, 1917, 1 single and 12 double-page illustrations; with several pages of text and colophons, originally published in 1804, reproductions of the works of Toyohiro, Utagawa. Basic Information. Collotype printing is a very high quality process that allows an extremely precise reproduction of tones. This process is best known for the ability to produce a full range of tones without relying on dots. Under magnification there is no evidence of a mechanical process such as a grid pattern, screen or dots. Instead, you see a texture with numerous fine curving irregular shaped lines. This type of pattern is known as reticulation. The collotype process is a very versatile process which can be executed on a variety of presses including letterpress, intaglio and lithographic. The collotype process was pioneered in Japan by Kazumasa Ogawa in the 1890s and, though it accounted for a relatively small amount of printing output, it immediately became highly respected as the printing method that produced the highest quality reproductions. This process was widely recognized as the premier method for reproducing art for publications and was used when a publisher required high quality photo-mechanical reproduction of photographs. This is a photo-mechanical process where gelatin is applied to a glass plate which is allowed to dry and then exposed to a photographic negative. Once exposed, a fine grained image is created on the reticulated gelatin. The exposed plate can be used to print onto paper. The fragile gelatin surface and glass plate limit the number of impressions that can be made. In a collotype image the detail is reticulated and appears like a mosaic with similar size pieces of irregular shapes. The size of the reticulation varies from print to print but cannot be seen by the naked eye. This process was invented in 1855 by Alphonse Poitevin and was immensely popular in Japan from the 1890's to the 1920's. Because of the high cost of copper associated with gravure printing, collotype became Japan's preferred method of printing over the gravure process. This process was recognized as a superb method of producing black and white and color images. However, it was an expensive labor intensive process and not suitable for high volume printing requirements. For many printing applications, it was replaced by the much lower quality off-set process beginning in the 1910s. However, for limited and high quality printing requirements, the process was commercially viable as late as the 1990s. Printed in Color (Multi-pass Process). These prints were created mechanically by a process said to be parallel to that used in chromolithographs. They are sometimes called chromo-collotypes and Ogawa even used the term chromo-collotype on the title page of some of his books. The famed K. Ogawa flower collotypes found in the Brinkley books are color collotypes created by the multi-pass process. There are 15 collotypes [A collotype is a kind of photo-lithograph in which glass replaces stone as the printing surface] of Japanese flowers produced by a process that could not be duplicated outside Japan. The colors used and mounting methods are most impressive. 15 to 25 colors were used in a single picture and each print passed through a press for each shade. First, an ordinary collotype is made, and this is handed to an artist, who colours it, using whatever may be the fewest pigments that he considers necessary to produce the effect that he aims at. An average number is about eight, but sometimes as many as twelve are used. The single copy having been coloured, a number of copies are taken corresponding to the number of pigments that have been used, and each of these is coloured by the same artist with the same one pigment, in the parts corresponding with those to which the same pigment was used in colouring the first collotype. These pigments are all of the nature of transfer ink, and a transfer is made from each to a lithographic stone. The transfers having been made, the collotypes are passed over the stones, each imprinted with one particular tint only, the number amounting to anything up to twelve. (The Photographic News, "Photo-Mechanical Work in Japan," February 22, 1895, Professor W.K. Burton, at page 118). The process described by Burton appears to be a merger of the collotype process with the chromolithograph process. 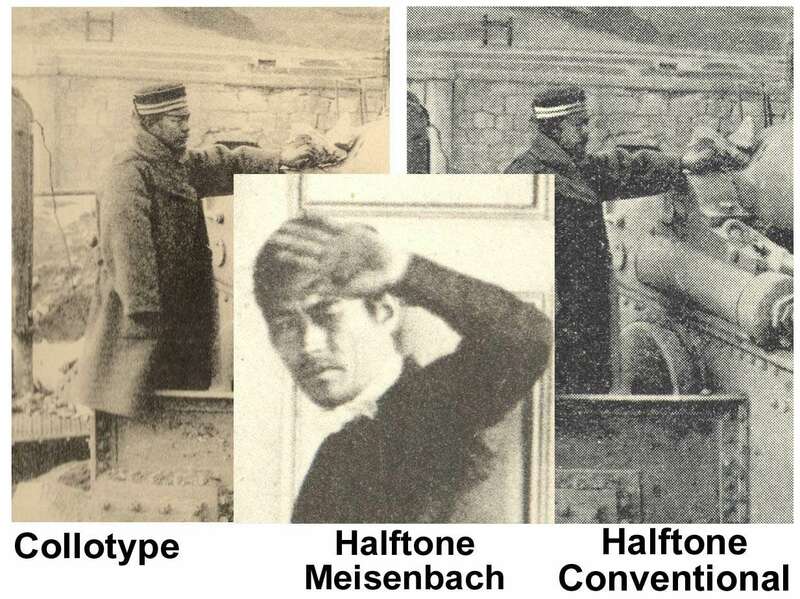 In an article published in Anthony's Photographic Bulletin, Volume XXVI, in 1895, Burton discusses all the printing techniques employed by Ogawa (black and white collotype, chromocollotye and Meisenbach photo-engraving process). To read this discussion, click here. I note that the Millet description, above, is somewhat at odds with Burton's description. However, I suspect Burton's description is more accurate when it comes to K. Ogawa's work. Handcolored. Just as with albumen photographs, collotypes were often handcolored. This was a common practice in Japan in the late 19th century and very early 20th century. In my experience, this was the primary process used to add color to these items in the Meiji era in Japan. You often find these compiled in albums for sale in the tourist trade. A more efficient and consistent method of hand coloring involved creating stencils for the colors to be used and then applying the colors over these stencils. Plates created by this method are referred to as hand-stencilled color collotype. Other Terms for the Process. Black and white collotypes are often designated as: Albertype, artotype, autogravure, autotype, heliotype, hygrotype, photogelatine, phototype, photolithographie and phototint. The color collotype process was named after its inventor and often called Hoeschotype. Color Woodcut. The woodblocks used to create the various colors are cut on the plank surface of the woodblock. Generally one block is cut for each color. A simple color woodcut (woodblock) would employ up to nine blocks. These prints are characterized by broad patches of color. Generally original art work was created with this process. Chromoxylograph (color from wood). The woodblocks used to create the various colors of a chromoxylograph are engraved/cut on the end grain of the woodblock. This makes it possible to break up the colors into more intricate patterns of finely engraved hatching. These prints have more intricate overlapping patterns. This process, because of the fine detail it allowed, was found to be a very useful method for reproducing art. The Shimbi Shoin was a leader in using this printing technique in the early 20th century. To see how they described the process, click here. You sometimes see this term used for a woodblock print, without a distinction, as to where the blocks were created from the plank or the edge surface. However, it seems to generally be applied to the finer prints created using the end grain of the woodblock. Mixed Methods. While I don't find it to be a common practice, some Meiji Japan era art reproductions were a created by a merger of the collotype and chromoxylograph processes. The basic image was created in a collotype print and then layers of color were added by the woodblock print process. To see an example, click here. 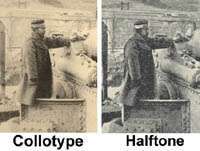 Photochemical (Photo-mechanical), Halftone Processes. In technical terms photo mechanical is another term for photo-chemical (combination of photography and chemistry). In the 1880s the primary photo mechanical processes were gravure, relief halftone, halftone offset lithography and metzograph screen. Photogravure Printing. A mechanical printing process that produces images of high quality and definition but not as fine as the collotype images. This printing is characterized (under magnification) by an extremely fine grid screen (white line grid pattern) of soft ragged square ink pits. The individual cells are of similar but not uniform sizes. This process entered widespread use in the 1890s. Unfortunately, the cell pattern is often very hard to detect. If an image in a 1880 to early 1900s publication is high quality with no dots and no fine curving irregular shaped lines (reticulation), it is probably a photogravure. The appearance of a photogravure has been compared to "confectioner's sugar." These images will be printed on thicker paper (mat) and accompanied by a protective sheet (tissue guard). To see an example of a photogravure image, click here. It should be noted that the photogravure process was not the favored process in Japan. Instead, the collotype process as first established by K. Ogawa, and later employed by the Benrido Company in Kyoto, was the premier photo-mechanical printing process. Relief Halftone Printing (photo-engraving) (letterpress). A less expensive mechanical printing process know as relief halftone was perfected in the 1870s and came into widespread use in the 1880s. In this process, the photographic image is recorded on a sensitized metal plate which is then etched in an acid bath. The halftone effect is accomplished by projecting the image through a wire or glass screen, which breaks the light rays so that the metal plate is sensitized in a dotted pattern; the larger dots create the darker areas, the smaller dots the high lights. The finer the screen, the greater the precision of detail in the printed product. The printed images lack the definition provided by photographs or the collotype process. A a photo-engraved relief halftone image is easy to identify. When you look at the image under even light magnification (x5 or x10) you see the series of dots with clean edges that make up the image. 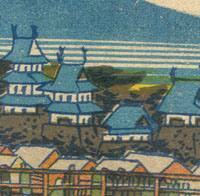 To see an example of four color relief halftone printed in Japan ca 1933, click here. It appears that ca 1894, Ogawa began printing plates using the conventional relief halftone printing method. You find the The Japan - China War (info here) printed in collotype and "photo-engraving" (relief halftone) formats. To see the difference in the plates click on the image below. Meisenbach Process Halftones. During the 1890s K. Ogawa was producing very high quality half tone impressions in addition to his collotype plates. 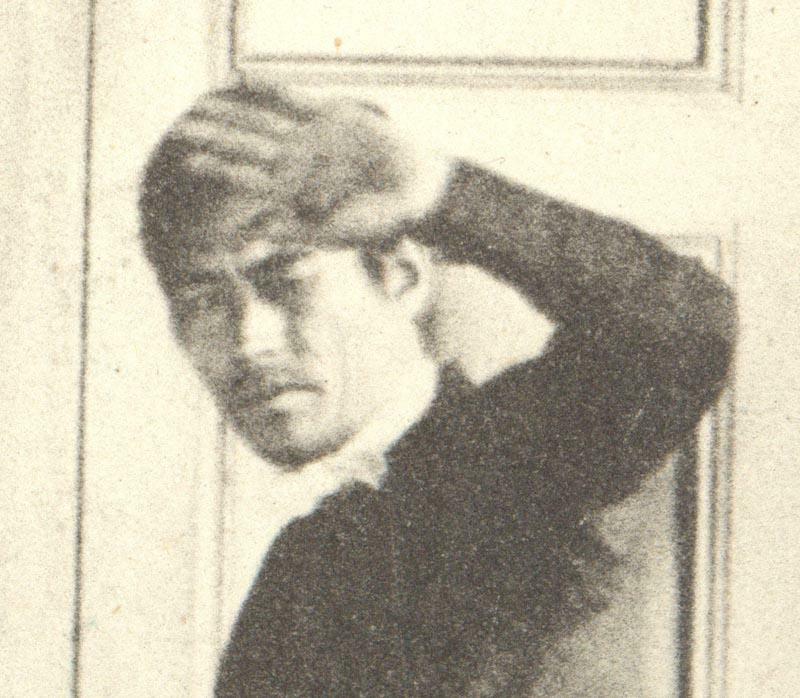 In February 22, 1895 in The Photographic News, W. K. Burton discussed Ogawa's "photo-engraving" activities. He discussed the process this way. The process worked is that generally coupled with the name of Meisenbach. That is to say, it is a process with a fine cross-line screen. The screens, 12 by 10 in size with lines spaced from 80 to 135 to the inch, are the well know diamond cut screens of Levy. They are the first of the kind that I have seen and are certainly most exquisite pieces of work, vastly superior to photographically prepared screens that I have seen and used. (The Photographic News, "Photo-Mechanical Work in Japan," February 22, 1895, Professor W.K. Burton, at pages 118-19). Mr. Ogawa's photo-engraving works contain collotype machines worked by hand; he also has machines driven by steam for photoengraving work. He uses the Meisenbach process, and obtains grain by the employment of the diamond-cut screens made by Levy. He finds a distance of one-fifth of an inch, including the thickness of the cover-glass of the screen, to be about the best distance for average work between the screen and the plate; he most commonly uses a diaphragm of about 1 inch square, with a lens of 13 inches focal length; the less the contrast in the original, the greater should be the distance between the screen and the plate. The greater the distance between the lens and the plate, the larger should be the diaphragm. The chemical process used is one which has been sold in Europe and America as a secret one, which had been bought by Mr. Ogawa, so Mr. Burton asked him no questions in relation thereto, and described alone what he saw, from which it appears to be the fish-glue process. Ogawa's re-etching is done by applying the etching fluid with a fine hair pencil to those parts of the plate which have to be deepened. Plates are made for the trade by Mr. Ogawa at a rate corresponding to about 6d. per square inch. He turns out prints of about cabinet size at the rate of more than two hundred for a penny, if he gets a large enough order and the paper is supplied to him; in such cases, however, six different pictures are etched upon one plate, or six small plates are fixed to the bed of the machine. (Anthony's Photographic Bulletin, "Photo-Mechanical Printing in Japan," Volume XXVI, Professor W.K. Burton, at pages 86-7, entire article is here). Burton also noted that Ogawa's negatives were made on collodion (wet plates) rather than dry plates. Copper plates coated with chemicals were then exposed to the negatives and the printing plates created. Burton notes that Ogawa made plates 'for the trade' and also could produce up to 6,000 impressions an hour on his four in house machines. At the time the article was written, Ogawa was involved in making half tone impressions of pictures of the Sino-Japanese war and was producing 100,000 impressions a day according to Burton. To see a close up example of this process from Ayame-san (Ogawa, 1892), click here. This book appears to be the first one produced by Ogawa with halftone images. The images in this book are very high quality and appear to be more like collotypes than halftones. I believe that in the 20th century Ogawa ceased using the higher quality Mesienbach process and started producing the lower quality halftones. To see the difference in the plates in collotype, halftone mesinbach process and halftone conventional process click on the image below. Offset Printing (offset lithography). In 1906 the offset printing press was invented. This mechanical process provided an efficient and economical method of high volume printing, particularly color printing. While color offset printing was no doubt introduced into Japan shortly after its invention, it was in common use by 1918. The best way to distinguish it from gravure and half-tone printing is by examining the dot pattern under magnification (x10 ~ x30). In gravure printing the dots, while of different intensity, are aligned in a white line grid pattern and they are similar in size. In half-tone and offset printing you do not find this white grid line pattern. In half-tone printing (letter press) the dots have clean edges and where they merge they often form a rim. In offset printing/offset lithography in pale areas where the dots remain separate the edges are blurred. In the darker areas no dots will be evident. The picture below is from a offset color lithograph in the book Tokaido: Hiroshige-ga Gojusan-tsugi Genjo Shashin Taisho (info on the book is here). If you are aware of books produced by Shimbi Shoin which are not listed above, your comments would be greatly appreciated. In addition, corrections/additions/comments regarding the above listing are welcome. If you have books published by Shimbi Shoin to sell, please get in touch with us.